divvy, a locally owned sharing plates restaurant & bar, encourages tasting new dishes & sharing among friends to create wonderful memories. divvy, from the owners of Woodys Library Restaurant, Richelle & Kevin 'Woody' Rider, offers a unique dining atmosphere for guests 21 & over. The menu features contemporary American small plates focusing on a dining experience to be shared. The sharing plates concept simply refers to several smaller courses allowing guests to sample more variety in one meal. Our extensive menu features over 100 small plates in the range of $3.95-$15.95, taster tours for wine, champagne, beer and port and plenty of options for special dietary needs including vegan, gluten-free and lactose-free. 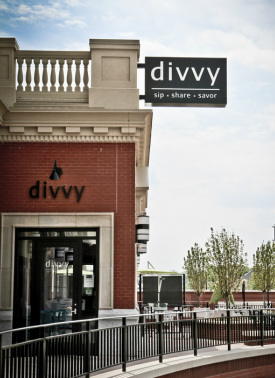 In addition to our popular small plates selections, divvy also offers lunch 11am - 3pm. Watch the video to meet co-owners Richelle & Kevin 'Woody' Rider. Visit the Hamilton County Tourism, Inc. online for information on local events & happenings.